Sh2-205 is a large nebula on the border of the constellations Camelopardalis and Perseus at an estimated distance of approximately 3,200 light-years. Sh2-205 is commonly referred to as the Peanut Nebula. The nebula is classified as a HII region and is divided into 3 sections identified as SH 149.25-0.0, SH 148.83-0.67, and LBN 148.11-0.45. HII regions are typically the site of active star formation. The image above is known as a Bi-Color (Near True Color) image and was acquired using narrowband filters. It was assembled by mapping Ha to Red and OIII to Blue and Green. 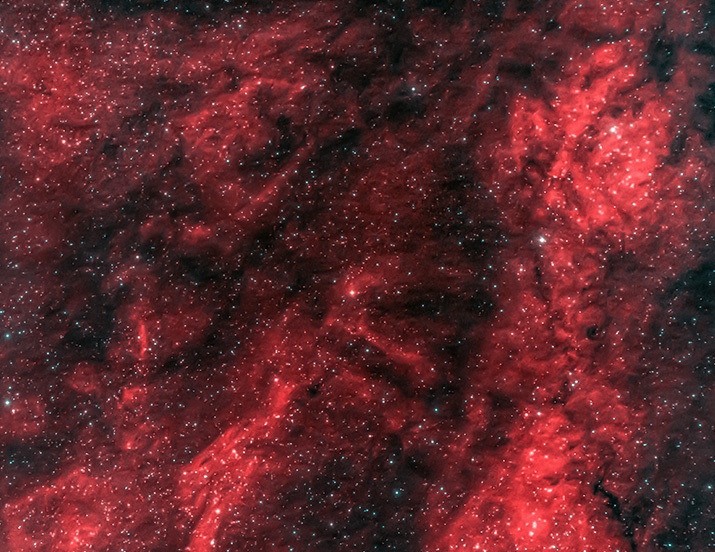 A Full Hubble Palette version of Sh2-155 may be viewed here.